What Is a Determinate or Indeterminate Tomato? 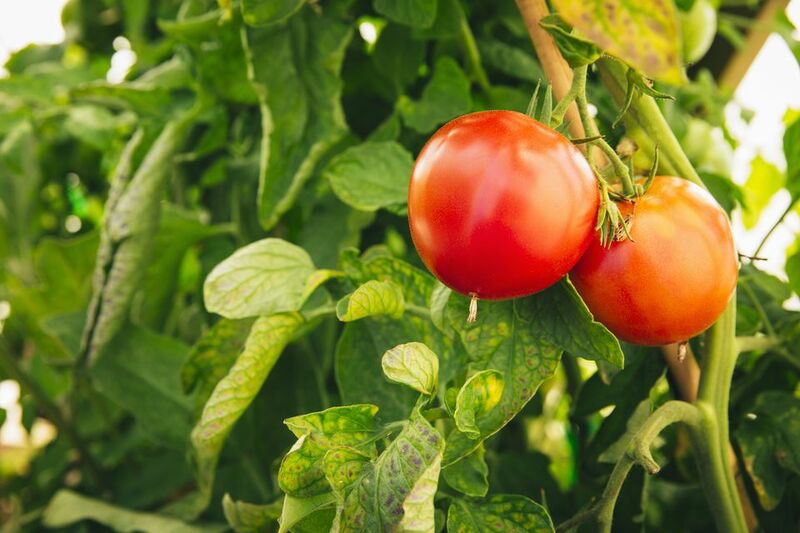 With the wide variety of tomatoes varieties, gardeners often focus on whether to grow standard, beefsteak, oxheart, cherry, Roma, grape, plum or one of the many types of heirloom species. But before getting to this point, there is a more basic decision to make: whether to grow determinate or indeterminate tomatoes. The basic differences are this: determinate tomatoes have a genetically programmed growing limit, growing to a defined height and then setting their flowers and forming fruit all at once. The limited growth pattern makes them ideal for container plantings or in garden areas with limited space. Indeterminate tomatoes, on the other hand, will continue and grow and produce fruit throughout the growing season. Given a long enough season, indeterminate tomatoes can grow to be rather bulky shrubs. They will also require more in the way of staking or caging over the course of the season. So robust is the growth pattern on some indeterminate varieties that ordinary wire cages are often inadequate. You may need to stake these champions with heavy metal rebar stakes or another sturdy support structure. So how do you decide what's best for your garden? If you have a large garden and would like heavy crops of tomatoes at certain points in the season, you might want to plan for several determinate varieties. You would look for two basic pieces of information in the plant catalog or on the plant label when making this decision. Look for the word "determinate" or the abbreviation "DET" so you know what you're dealing with. Next, look for the number of days at which the plant will set fruit. To get several nice harvests, try to combine determinate varieties that bear early, mid, and late season. If you are into canning, saucing, or drying your tomatoes, this is probably the best way to go -- a lot of tomatoes all at once. If you want tomatoes for the course of the season for snacking and adding to salads and sandwiches, it is best to go with indeterminate varieties. Several types of indeterminate tomatoes are very prolific, and a plant or two will more than suffice to meet your needs. Many favorite heirloom tomatoes are indeterminate varieties. When shopping for your tomato plants, you will be looking for "indeterminate" on the label, or the abbreviation "IND" (or, less commonly, "INDET"). If you want to grow in containers, you'll probably want to stick with a few different determinate varieties. They are more well-behaved and better suited to container culture. You can certainly grow indeterminate tomatoes in containers, but be prepared to be vigilant about staking or caging, as well as pruning the suckers to maintain compact growth. Both indeterminate and determinate tomatoes offer choices for all the various classes of tomatoes. You can find both determinate and indeterminate beefsteak or Roma or cherry tomatoes, for example. Better Boy: Indeterminate hybrid beefsteak tomato. Produces fruit 10 to 16 oz. in size about 75 days from planting. Big Beef: Indeterminate hybrid beefsteak tomato. Produces fruit 10 to 12 oz. in size about 73 days from planting. Was a 1994 All-America Selections Winner. Big Boy: Indeterminate hybrid tomato. Produces fruit 10 to 16 oz in size about 78 days after planting. Celebrity: Determinate hybrid globe tomato. Produces fruit about 8 to 10 oz. in size about 70 days from planting. Early Girl: Indeterminate hybrid globe tomato. Produces fruit about 8 oz. in size about 50 to 52 days after planting. Juliet: Indeterminate hybrid elongated cherry tomato. Produces 1 oz. fruit about 60 days after planting. Was a 1999 All-America Selections Winner. Sun Suger: Indeterminate hybrid cherry tomato with orange fruit. Produces 1 oz. fruit about 62 days after planting.